MD is our VBF Co-Medical Director & Research Director, and was instrumental in VBF's founding. Dr. Mihm is the Director of the Mihm Cutaneous Pathology Consultative Service at the Brigham & Women’s Hospital, specializing in Internal Medicine, Dermatology, Pathology, and Dermatopathology. He founded one of the first five residency training programs in Dermatopathology in the United States. He is currently co-director of the EORTC melanoma pathology program. He has written over four hundred articles and authored and co-authored twelve books. 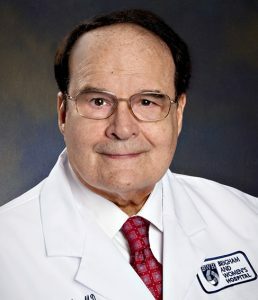 He started residency in dermatology at the Massachusetts General Hospital (MGH) in 1964 and after completing pathology residency joined the staff in 1973. He is board certified in Dermatology, Pathology, and Dermatopathology. He founded one of the first five residency training programs in Dermatopathology in the United States. Throughout his career, he balanced teaching, research, and excellent clinical service in the field of Dermatopathology. On July 1, 2010, he assumed the position as Director of the Melanoma Program in Dermatology at the Brigham and Women’s Hospital and Associate Director Dana-Farber and Brigham and Women’s Cancer Center. He is currently co-director of the EORTC melanoma pathology program. He has written over four hundred articles and authored and co-authored twelve books. He began his melanoma studies with Dr. Wallace Clark in 1965 and coauthored the first publication of the classification of malignant melanoma into subtypes. He also contributed to establishing the importance of tumor infiltrating lymphocytes as an important prognostic factor in primary and metastatic melanoma. Through collaborations, with other prominent, researchers his efforts led to the discovery of the role of basophils in human hypersensitivity reactions, and to the first description of the role of the vasculature in human allograft rejection. He also participated in the study of vaccine reactions to autologous melanoma cells and contributed to the description of various factors affecting the host reaction and their relationship to survival. Other notable contributions include the study of vascular anomalies, where the discovery of a specific phenotype in infantile hemangiomas has led to extensive studies on pathogenesis of these lesions. While excelling, as an academician and clinician, he has also built a busy consultation service. To date, he has consulted on more than 300.000 cases, nationally and worldwide, and continues to offer accurate diagnosis, prognosis, and treatment recommendations on routine and challenging cases in Dermatology/Dermatopathology.